Today I had to shell out a good chunk of dough for the 30,000 mile tune up on my car. The money out of pocket is the bad news. The good news is that all my service shop gives out a real treat when you get your car serviced. What could it be? Ice cream? Cake? Wine? Sure all those things would be nice. I can’t explain it, but I love the car wash! It just makes me giddy, when you drive in, and the automatic conveyor belt pulls the car along in little fits and starts. You smell that wonderful soap smell, and hear the first pelting of water on the windshield. And the brushes – I always laugh when the brushes come over the car, enveloping you in a little car wash cocoon. Then there is the next pelting rinse cycle – you just feel cleaner as the water pours over the sunroof and down the windows. And then it ends with that whoosh of air, drying off the car. I don’t need to have company in the car wash – I’m content just going through all by myself. And I laugh out loud every single time! My mom and my husband both think my love of car washes is really strange. But it is just one of my favorite simple pleasures. Who can be in a bad mood in a car wash!? What is your strange simple pleasure? I am hiding under the bed right now – that’s the safest place. 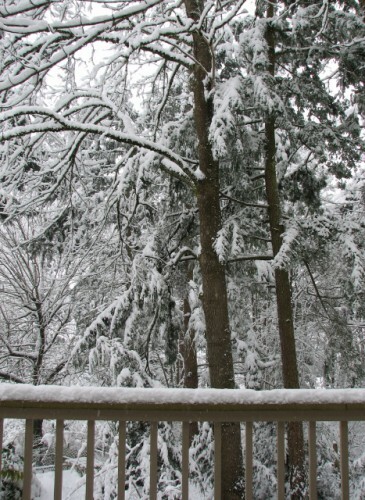 I’ve been under here since late last night – when the apocalypse began. My mom tried to get me to come out for breakfast – she shook the bag of food and I finally came downstairs. But then I saw the windows… I am too smart for them. 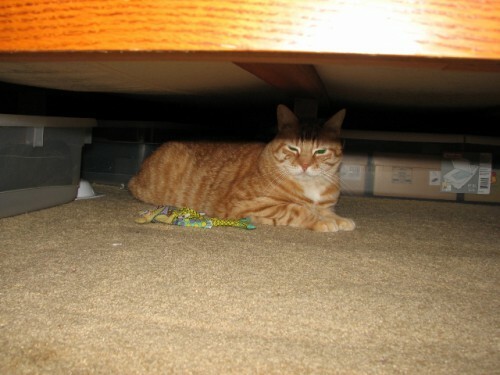 I hid under a chair until I could make a break for safety – back under the bed. A couple hours later my mom came upstairs and dragged me out from under the bed. She said she wanted to make sure I wasn’t sick. I’m not. I’m the only sane one around here apparently. She saw my fear whenever I looked towards the windows. I buried my head in her elbow until I could get away. I don’t want to see such death and mayhem. My dad went outside right before that. I heard the door open and close. He’s going to die. I know it. He’s not coming back. EVER. Oscar and Coraline are idiots. Oblivious. Just sitting there in their beds, lounging and sleeping, waiting for the end to come. They don’t even know that it is near. They will certainly die too. I’m not sure what’s going to happen, but I hear the sounds of something rolling off the roof and hitting the deck. It is terrifying. It is probably hand grenades. Or bodies. Yes, it is probably bodies. I don’t know how they got up there, but I am certainly not going to leave my hiding place to find out. Best to wait it out and see who is still alive at the end. 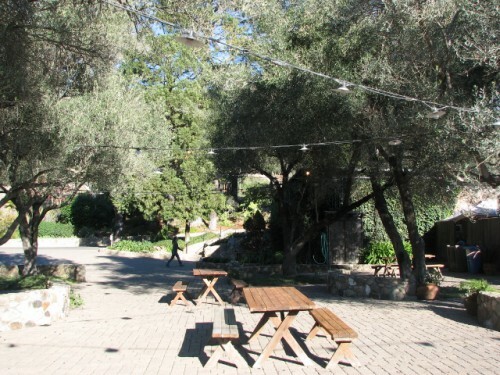 After our trip to Gundlach Bundschu, we visited Schug Winery. Schug was founded by Walter Schug and his wife Gertrud in the 1970s. Both of them grew up in Germany with fathers who managed wine estates, and Walter learned the trade at several wineries in Germany, England and California. Once they moved to the United States, Walter worked at the winemaker for Joseph Phelps Vineyards in the 1970s before starting his own winery. Schug is located just outside of the town of Sonoma. 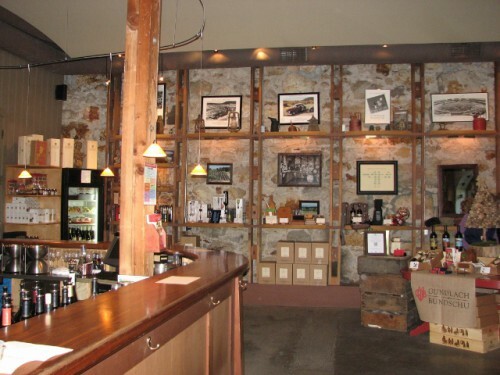 They produce about 40,000 cases annually but you wouldn’t know it from their tasting room – it is tiny little space! I was a bit surprised by that, but we were greeted warmly by the server there and guided through the line-up. 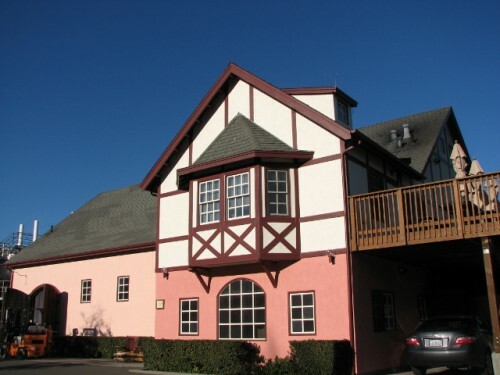 Schug Winery – the tasting room is just the dark pink section in the middle. Cozy! Their Rouge de Noirs sparkling wine is where it is at. It is a great sparkler with light bubbles, and a fruity, effervescence. It is made from 100% Ricci Vineyard Pinot Noir, fermented with the skins for 3 days and then a bleeding off of the juice with no pressing. The Carneros Pinot Noir was very good too – it is their flagship wine with more than 5,000 cases produced. To be honest, I did like the Estate Pinot better, but not enough to justify the extra $12 in price. Their Sauvignon Blanc was not on the tasting menu, but our server let me have a taste and it was a delicious acidic Sauvignon Blanc with flavors of grapefruit and honey. We went home with the Sauvignon Blanc, the Carneros Pinot Noir and the Rouge de Noirs – but I would be happy drinking anything that we tried that day! 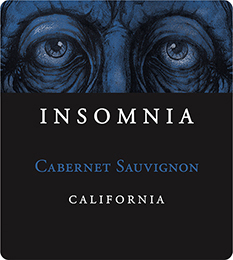 We can’t always drink expensive wine, so tonight we tried out a very affordable California Cabernet Sauvignon from Insomnia Wines in Buellton, California. It was only $9 with the six bottle discount at Fred Meyer. On the nose, there is lot of smoke and tobacco. On the palate there are flavors of ripe figs, more smoke and tobacco, and vanilla on the finish. As big as that sounds, this wine is very approachable, with enough fruit to make it an easy drinking wine. I paired it with bratwurst baked in beer – an India Pale Ale, and vegetables baked in Greek dressing – red beets, carrots, red potatoes and cabbage. It was delicious! And the extra bonus is the label – the label is actually a hologram, so when you look at it from different angles, the eyes change. Too bad it doesn’t show in the photo… Just proving that I am still a sucker for a good label. It had been a long week – several long weeks all running together actually. So it was timely that Noémi Ban was speaking at the university this week – a coworker and I went to see the presentation. Noémi Ban is a Hungarian born Jew – she became a United States citizen after she immigrated here. She was born in 1922, and she was 21 years old when the Nazis invaded Hungary. When you hear her speak, a palpable silence comes over the room. The only sound comes from her voice, thickly accented and still strong. She speaks simply, not going into too much detail about the emotions she must still feel vividly, even after all this time. She tells the audience about how her family was deported to Auschwitz; told to bring only a small parcel with food, and a change of underwear. No valuables, not even wedding rings. She tells of the stench of the cattle cars they rode in for 8 days. With one bucket for water, and one bucket for a toilet. For 85 people. She explains how, on their arrival, they are told not to bring their parcel with them. She doesn’t break when she explains how her family lined up at the entrance of Auschwitz, how she was the only one in her family who was sent to the doctor’s left side. How she didn’t know then what it meant to be sent to the right. It was only later that she found out the doctor’s name. Josef Mengele. She speaks candidly about having her menstrual period on the day that she arrived in the camp. How she refused to drink from the bowl of soup that was sent down the line of women prisoners, because so many mouths had already been on it by the time it reached her. The guards told her that next time the soup was passed to her, she would drink. Or else. She understood what “or else” meant. The soup made her period stop within an hour. She didn’t know it at the time, but the soup contained toxic chemicals that permanently sterilized many of the survivors. She speaks of how, after 4 months at Auschwitz, she was sent to Buchenwald and began working in a factory building bombs for the Germans. She explains how the Nazi guards didn’t seem too concerned with watching the women much, choosing to spend much of their time in an adjoining room. This gave her and the other women an opportunity to deliberately wire the bombs incorrectly, so they wouldn’t explode on impact. She laughs lightheartedly when she explains their sabotage, as if she were explaining a childhood prank. She tells us that she did this forced labor for seven months. She maintains her composure when she explains that when the Americans were getting close, the Nazis forced the inmates at Buchenwald to march to Bergen-Belsen concentration camp. Noémi and several other women managed to escape from the march and run into the forest. She tells of hearing a man, and the profound relief she felt to discover it was an American soldier. She laughs when she tells of how she and the other women kissed and clung to the soldier, only letting go when he told them they might strangle him. She was liberated in April, 1945. Her voice gets soft when she tells us that her father was the only other family member who survived the war. Her mother, sister, brother, grandmother, aunts, uncles, nephew, cousins – 21 family members in all, were all sent to the gas chamber. She cracks a little when she recounts how she had to tell her father about their fate – how she wanted to tell him because she didn’t want him to hear it from somebody else. She was 22 years old. You would think the sad part of the story ends there, but it doesn’t. She tells the audience that after getting married and having two sons, she was living in Hungary during the Soviet occupation after the war. She became a teacher. And in 1956, she and her family escaped from Communist rule by hiding themselves in giant balls of yarn that were being shipped across the border to Austria. They came to the United States in 1957. She gets angry as she talks about the people who say the Holocaust never happened. How she wishes she could sit with them and ask them to explain what was done to her. She ends her presentation by telling her audience that she learned to love life in Auschwitz. Everything else she has endured must pale in comparison to Auschwitz. Where she learned to love life. She ends with a statement that must seem obvious by now.